I have found that some PCM's tach signal is not strong enough for some aftermarket tach's. I used this method to fix the tach signal on my 2003 PCM with an Autometer 5" tach. All you do is hook one end of a 1000 ohm (1K OHM) resistor to the tach wire, and other end of resistor to key 12v+. 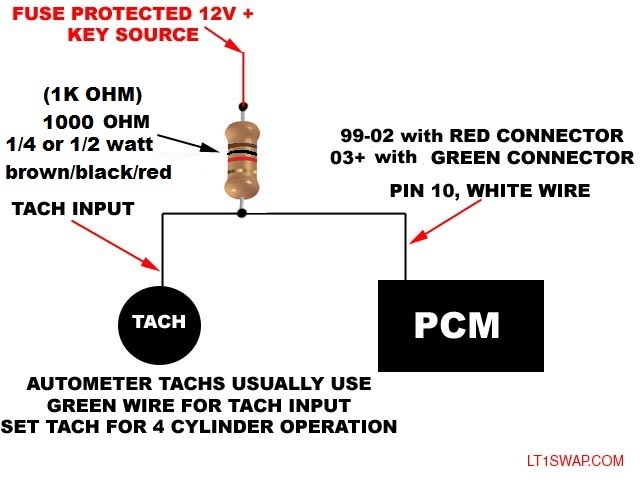 The tach wire is found on the RED PCM connector for 1999-2002 vehicles and the GREEN PCM connector on 2003-2006 vehicles. This may not be needed on all, I have had a 12200411 PCM from a 2001 work just fine without the resistor. So far, all 2003+ have had to have it. Back to 99+ Vortec Wiring Harness Info Page.